This Children’s Day (November 14), StoryWeaver is eager to create a fun spotting book for children and make it available for free. We think this will be special if it’s a collection of illustrations from artists around the world. And this, illustrators, is where we need your support. Just 1 illustration from you can make all the difference! The best entries from Spotathon will become part of a grand spotting book published by StoryWeaver, filled with illustrations from different artists. However, each entry that is submitted as part of Spotathon will be available on StoryWeaver as an individual activity book as well. Here’s how you can participate in Spotathon! 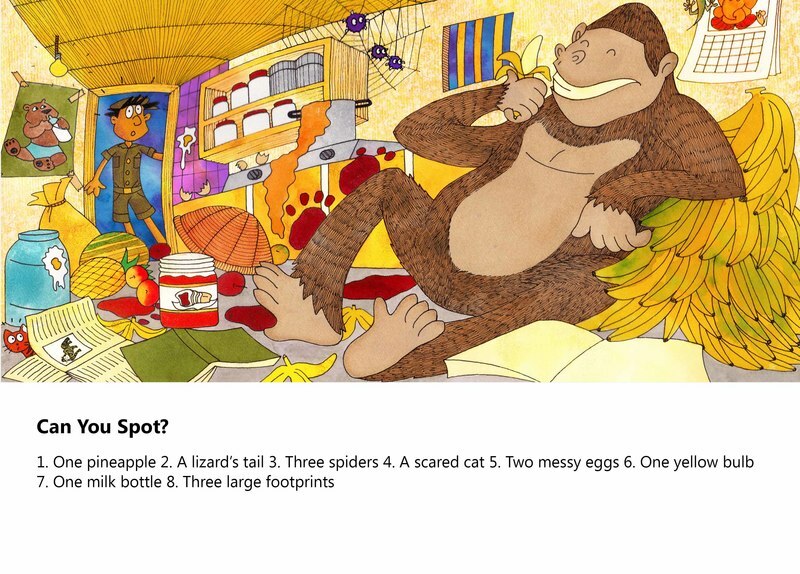 Draw something which has enough details so that a child can spot up to 15 objects in it. Think of a setting which can accommodate these details. A beach, rainforest, kitchen, classroom, market... the possibilities are endless! The objects to spot are up to you. Before you start, imagine the child you’re setting the challenge for. Our readers are primarily children who haven’t had much access to books. We have 2 different categories which are linked to age and levels of difficulty. Remember, these are only guidelines. a. 3-6 years (Level of Difficulty: Easy) – She has only recently started reading books. She’d enjoy spotting up to 8 objects. While she’s open to all kinds of settings, do remember that her vocabulary is limited. But her imagination definitely isn’t! 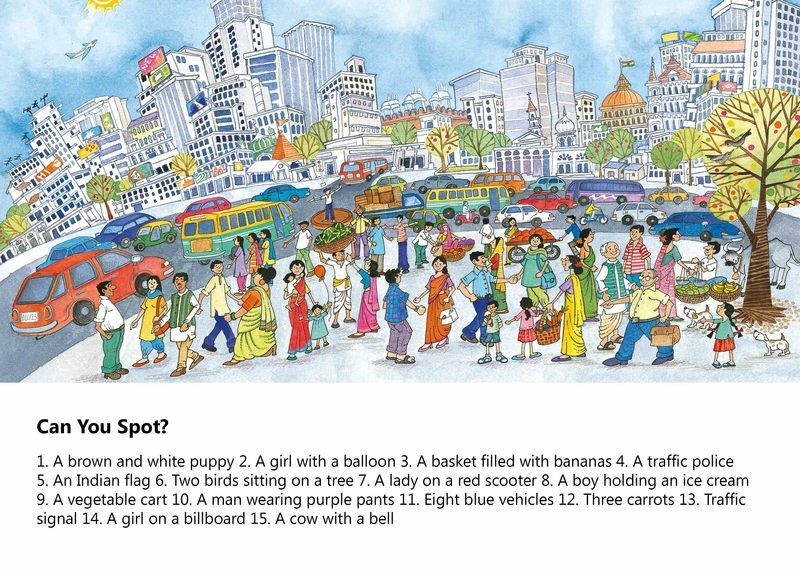 As an example, here is an illustration by Soumya Menon of what would be ideal for her. b. 7-10 years (Level of Difficulty: Medium) – As she’s expanding her vocabulary, she will be more comfortable with prediction and open to unfamiliar settings. She’d be able to spot up to 15 things. Even the way in which the objects are hidden can be more complex here. As an example, here is an illustration by Bindia Thapar of what would be ideal for her. As the spotting exercise also requires an answer key for reference, you will need to prepare it using the same drawing. All you have do it number the images accordingly. Here’s an example. Spotathon begins on October 25 and ends on November 21. You will have to submit two illustrations: Main Illustration and Answer Key (examples above). You can submit your entry in any language that is available on StoryWeaver. You can submit more than one entry. Watch a short Video Tutorial on how to submit your entry on StoryWeaver. Size of illustration (Main illustration & Answer Key): 11.17 inches (width) x 5.35 inches (height). This is the recommended size as it fits neatly into one of the templates on StoryWeaver. The illustrations should be high-res (150-300 dpi). To participate in Spotathon, you must be over the age of 16. The illustrations you submit must be your original work. By submitting your work, you are agreeing to a CC-BY 4.0 license being applied to it. To know more about this license, click here. You can register for the campaign over here so that we know you're participating and can reach out for any updates. If you have any queries, feel free to drop us an email at storyweaver@prathambooks.org!